If it feels like we haven’t heard from our old pal the boss of Tesla after a wild series of events I’ve taken to calling the Summer of Elon, it’s because he’s facing some serious allegations from the Securities and Exchange Commission over his failed Twitter plan to take the public company private. And the SEC’s complaint against Musk, which outlines its investigation so far, makes some incredibly damning and bizarre allegations against the CEO. 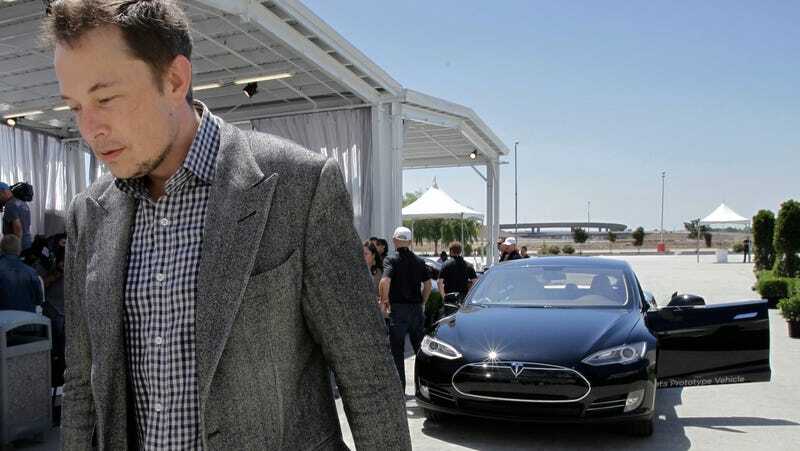 To recap: on August 7, Musk tweeted that he had “funding secured” to take his nascent electric car company private. That funding never materialized, though it was later revealed he intended for the Saudi Arabian sovereign wealth fund to make the move happen. That fell through when it materialized Musk may have overplayed his hand; he later withdrew from this claim, saying Tesla would remain public on Aug. 25. The SEC investigated the matter and now claims Musk made a “series of false and misleading statements,” and, in this civil complaint, is seeking to bar Musk from operating Tesla as CEO or director. “It was virtually certain that he could take Tesla private at a purchase price that reflected a substantial premium over Tesla stock’s then-current share price, that funding for this multi-billion dollar transaction had been secured, and that the only contingency was a shareholder vote. In truth and in fact, Musk had not even discussed, much less confirmed, key deal terms, including price, with any potential funding source,” the complaint said. Musk countered the allegations today. Why such an extreme reaction from the SEC? Let’s review some of the wilder moments from today’s 23-page complaint. According to Musk, at the meeting the Fund’s lead representative told Musk that the Fund had recently acquired almost five percent of Tesla’s common stock on the open market, expressed interest in taking Tesla private, and confirmed that he was empowered to make investment decisions for the Fund. Musk later stated that he assumed without confirming that the lead Fund representative was proposing a “standard” going-private transaction, but the terms of any such deal were not discussed. The July 31 meeting lacked discussion of even the most fundamental terms of a proposed going-private transaction. For example, there was no discussion at the July 31 meeting of (1) any dollar amount or specific ownership percentage for the Fund’s investment in a going private transaction; (2) any acquisition premium to be offered to current Tesla shareholders; (3) any restrictions on foreign ownership of a significant stake in Tesla; (4) the Fund’s available liquid capital; (5) whether the Fund had any past experience participating in a going-private transaction; (6) any regulatory hurdles to completion of a going-private transaction; or (7) the board approval process necessary to take Tesla private. Musk has acknowledged that the July 31 meeting was the most specific discussion of a transaction to take Tesla private between him and representatives of the Fund. So that’s a pretty far cry from “funding secured,” as he would tweet just a week later. This may be the most damning part of this complaint, if it is upheld. According to Musk, he thought that there was “a lot of uncertainty” regarding a potential going-private transaction at the time of his August 2 email to Tesla’s board, “but it was worth investigating.” He believed at the time that the likelihood of consummation of a transaction was about 50%. This has been previously reported, but the complaint notes Musk’s claim came as a surprise to the board and the rest of management. In fact he’s accused of not discussing it with anyone before tweeting it to his 22 million followers. There was no formal proposal to the board. These uncertainties notwithstanding, on Tuesday, August 7, 2018, Musk published a series of statements about a transaction to take Tesla private using his personal Twitter account. Musk did not consult with Tesla’s Board of Directors, any other Tesla employees, or any outside advisors about these tweets before publishing them. He also did not notify NASDAQ prior to the tweet, as that stock exchange’s rules require, the complaint says. In fact, Musk later admitted, “I thought the vast majority of existing investors would want to maintain their stake, and we would find a vehicle for small investors to participate. That latter part was a fundamental misunderstanding that I just did not know — I thought there would be some way to retain small investors, but there isn’t.” Musk’s statements regarding specific terms of a transaction to take Tesla private created the misleading impression that these terms had been decided upon, when in fact, they had not even been investigated or determined to be possible. And thus, this is why the SEC seeks Musk to be “prohibited from acting as an officer or director” of Tesla.